Cyber talent shortage, rapidly evolving threats, and unique agency policies are every day security challenges for today’s government cyber professionals. DHS’s CDM program provides light at the end of this long tunnel of challenges. The CDM program is now on the cusp of transforming the way government does business by making Federal agencies more AWARE of their total cyber risk with a new enterprise dashboard capability. The program is taking a page out of DoD’s book with new .govCAR architecture reviews, but there’s a lot the Pentagon can learn from government’s biggest civilian cyber initiative. 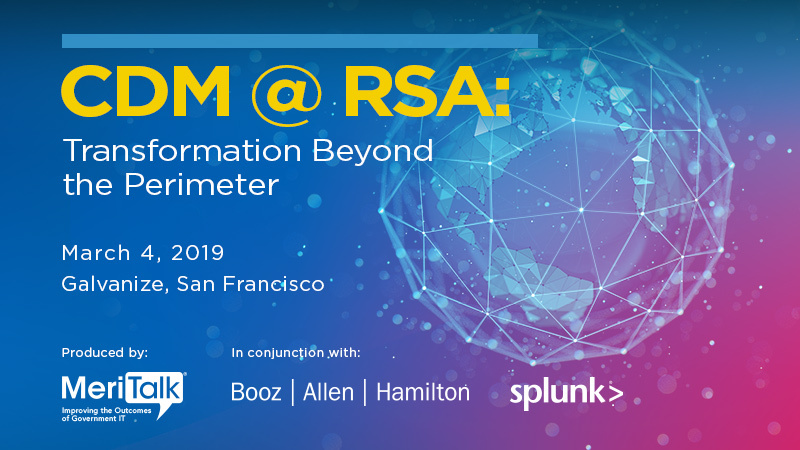 Join MeriTalk, Booz Allen Hamilton, and Splunk on Monday, March 4th at Galvanize San Francisco for an executive breakfast discussion on the future of the CDM program. We’ll explore how agencies are shifting to address the dynamic threat environment, the impact future IT modernization plans will have on existing security programs, the importance of zero trust networks, and much more.